In the winter of 1918-19, the British government found itself in something of a quandary. On the one hand, hurrah, the war was over! Everyone who had signed up to serve for “three years or the duration” could go home. And, goodness, did they want to go home. On the other hand, the war… well it wasn’t really over. There were British troops fighting deep inside Russia; there were large garrisons sitting in western Germany (and other, less probable, places) in case the peace talks collapsed; there was unrest around the Empire and fears about Bolsheviks at home. So they raised another army. Anyone in the army who volunteered to re-enlist got a cash payment of £20 to £50 (no small sum in 1919); two month’s leave with full pay; plus comparable pay to that in wartime and a separation allowance if he was married. Demobilisation continued for everyone else (albeit slowly), and by 1921, this meant that everyone in the Army was either a very long-serving veteran, a new volunteer who’d not been conscripted during wartime (so born 1901 onwards) or – I suspect the majority – re-enlisted men working through their few years service. For administrative convenience, all records of men who left up to 1921 were set aside and stored by a specific department; the “live” records, including more or less everyone who reenlisted, continued with the War Office. They were never transferred – and, unlike the pre-1921 records, they were not lost in a bombing raid in 1940. The MoD has just released an interesting dataset following an FOI request – it’s an index of these “live” service records. 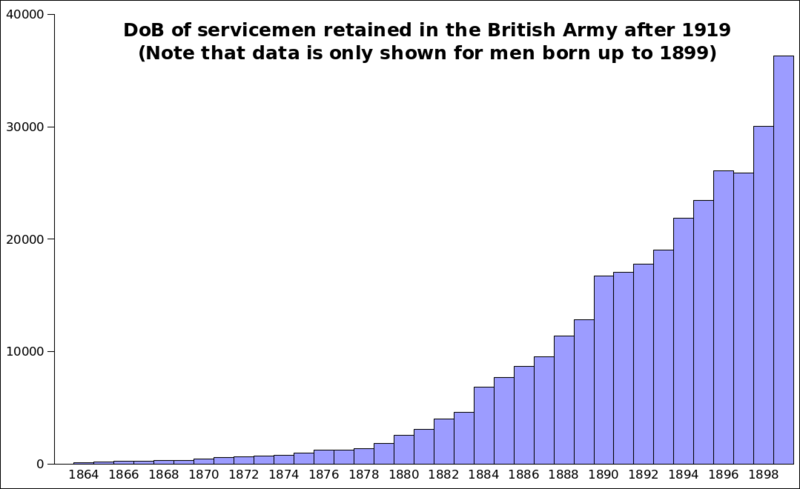 The records cover all men in the post-1921 records with a DoB prior to 1901, and thus almost everyone in it would have either remained in service or re-enlisted – there would be a small proportion of men born in 1900 who escaped conscription (roughly 13% of them would have turned 18 just after 11/11/18), and a small handful of men will have re-enlisted or transferred in much later, but otherwise – they all would have served in WWI and chosen to remain or to return very soon after being released. So, what does this tell us? Well, for one thing, there’s almost 317,000 of them. 4,864 were called Smith, 3,328 Jones, 2,104 Brown, 1,172 Black, etc. 12,085 were some form of Mac or Mc. And there are eight Singhs, which looks like an interesting story to trace about early immigrants. But, you know, data cries out to be graphed. So here’s the dates of birth. Since the 1900 births are probably an overcount for reenlistments, I’ve left these off. It’s more or less what you’d expect, but on close examination a little story emerges. Look at 1889/90; there’s a real discontinuity here. Why would this be? Except “Reserve” agin’ him—’e’d better be never made. It probably wasn’t much better for him in 1919. Moving right a bit, 1896-97 also looks odd – this is the only point in the data where it goes backwards, with marginally more men born in 1896 than 1897. What happened here? Anyone born before August 1896 was able to rush off and enlist at the start of the war; anyone born after that date would either have to wait, or lie. Does this reflect a distant echo of people giving false ages in 1914/15 and still having them on the paperwork at reenlistment? More research no doubt needed, but it’s an interesting thought. Pingback: Generalising » Blog Archive » When do you think you were born? Next Next post: When do you think you were born?